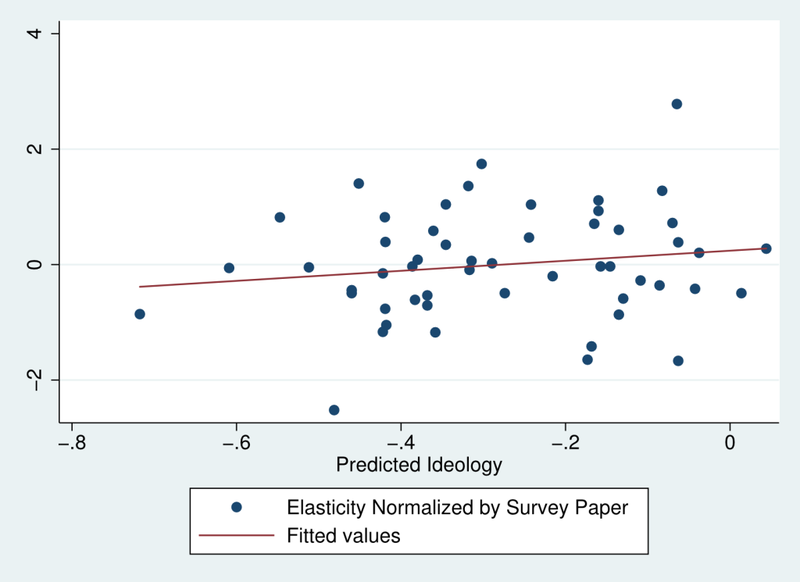 Does ideology influence economists' work? Update: the original graph shown below turned out to be an error. The authors have updated their post with the correct graph. I have an updated discussion of the new graph here. To be clear, there are other measures which they discussed in the paper besides the one presented in that particular graph. To the extent that the discussion below was specifically about that one graph, refer to my new post. Sure. There are ways in which we cannot help but let ideological considerations affect our work. A researcher must, for example, pick a research question to study, and the questions that sound interesting and important sound that way because of their ideological priors. And for many things economists are asked to do--like, say, derive an optimal tax policy--that cannot be completely separated from a subjective ideological determination. What welfare function do we optimize the tax code against? What criteria define the "optimal" condition? Despite a century of effort, we've not found a truly scientific way to answer these questions--individual-level choices do not aggregate in ways that let us use the standard revealed-preference framework to evaluate these issues. Scatterplot of study findings versus constructed index measure of researcher's ideology. Now, that's not what the authors of the graph above claim: they listed this graph as evidence of pervasive ideological bias in economists' work. I don't see it. Noah Smith says this is all about the R-square, not the coefficient, and he's absolutely right. Let me illustrate that point with a different graph. Does this regression line still look like it fits that data? The same graph as above, with two datapoints deleted. It does not. In fact, it looks like the regression line should actually be downward sloping! Obviously, this is just the same graph as above, and the only thing I've done is removed two datapoints. They were the two most extreme observations in the graph--the highest and the lowest of the reported normalized elasticities. A result that depends on two out of many data points is not a result. My guess is that the p-value was small enough to be statistically significant only because of the way least-squares estimation gives disproportionately greater weight to extreme values than the ones in the middle of the pack, and those extreme values happened to fall pretty far out on their measure of ideology (which, by the way, correctly predicts authors' ideology less than 75% of the time anyway). The term statisticians often use is "robust"--their estimates are not robust, even if the p-value was small. I don't have the raw data to confirm, but it looks to me that as far as the non-outlier data is concerned, there does not appear to be a correlation here. Side note: Brian Albrecht is right that it doesn't make any sense to claim the slope of the regression line is "small." We're correlating two constructed measures, so the magnitude of the slope has no discernible interpretation. But, the point is that an effect of this size cannot explain a noticeable fraction of the total variation in economists' results. There's in fact *no significant correlation* shown in the graph. Something really iffy is going on here. Coauthor of paper here. Just wanted to point out that do a communication error the incorrect chart was posted on 538. The correct version is now up and is from Figure 9 in the paper. 1. How can "predicted ideology" be accurate enough to make this graph worth debating? 2. I think it's the insidious / invisible aspects of ideology—not liberal/conservative tug-of-war—that drags down economic theory. "Theory blindness", as Kahneman & Tversky put it.